Charming quiet South-exposed house in a very quiet setting in Lanmodez with unobstructed sea view from all rooms, direct access from the garden to the small fine sandy beach, landscape changing according to the tides, very comfortable separate kitchen and dining room and living room separated by a fireplace. On the first floor, there are 3 bedrooms. Outside, there is a laundry room with washing machine, tumble dryer and extra shower ideal when you come back from your fishing day. There is a closed garage for 1 car or maybe 2 if you do not close it. In Lanmodez you can buy oysters and mussels. You can directly buy lobsters and crabs to the fishermen 2 km away and you can directly buy vegetables and meat to producers. This heavenly place is located in the wild peninsula. There is a 500 m² fenced garden with furniture, sunloungers and barbecue, baby equipment with baby cot upon request and 2 bikes at your disposal for free to visit our wild peninsula. Go hiking along the shore on the GR34 with exceptional views. Fishing from the shore, nearby horse riding, canoeing, sailing, sea excursion with guide, discovery of the Bréhat Archipelago, sailing beginner course in Loguivy-de-la-Mer, scuba diving, sea fishing, tennis, visit of the remarkable site of Sillon de Talbert 2 km (hiking on an arm of land that stretches into the sea), L’Arcouest jetty to Ile-de-Bréhat (Island of Beauty) 12 km and departure for a boat trip to Château de la Roche-Jagu where you can visit its palm grove, the Cathedral of Tréguier 14 km, Paimpol and its market famous for its local products 12 km, nearby Perros-Guirec, the Pink Granite Coast, tree climbing, the Cité des Télécoms, Gallic village, Zoo de Trégomeur 35 km, nearby restaurant, bar, bakery, fish shop, butcher’s shop, pharmacy and supermarket in a 3 km-radius. If you are looking for quietness, an excellent sightseeing stay in couple or in family is guaranteed. Enjoy the unobstructed views from the house to recharge your batteries and relax without forgetting to visit our wonderful touristic region. Pors Guyon is the small fine sandy beach where I spent my holidays during my childhood because my grandfather used to live nearby. So many memories! Lanmodez is my birthplace village. I fell in love at first sight with this house facing the sea with direct access to the beach and exceptional panorama. Breton solid oak dining room separated from the living room by a fireplace. The living room consists of: 3-seat relaxation sofa, 2 relaxation armchairs, television and DVD player. Flowered garden equipped with garden table and chairs and sunloungers with sea view and direct access to the beach. This South-exposed house in its flowered fenced garden with direct sea view is a small quiet haven of peace with direct access to the small beach of Pors Guyon: fishing from the shore, canoeing, horse riding, GR34 hiking and baby equipment (cot, high chair, pushchair, bath, etc.) There is a high-quality fully fitted separate kitchen with washing machine. You are also provided with 2 bikes for free to serenely visit our wild peninsula where you will enjoy good Breton crepes, visit the Sillon de Talbert 2 km and go to waterfront restaurants. You can directly buy oysters and mussels in Lanmodez. You can directly buy meat, fish and vegetables nearby. This very quiet South-exposed house is in an exceptional location with fenced garden, unobstructed sea view and direct access to a small beach called “Pors Guyon”. There is a nearby anchorage for leisure boats. On the horizon, you can see Ile-de-Bréhat. Landscapes change according to the tides. Nature lovers can go hiking on the GR34 and enjoy sea panorama. Breton heritage, visits of the Cathedral of Tréguier which is the town of Ernest Renan and the chapels. It is 12 km from the train station of Paimpol, town of Pierre Loti with famous market on Tuesday morning with regional products. In Lanmodez, you can directly buy mussels, oysters and crustaceans and vegetables and meat in the surroundings. 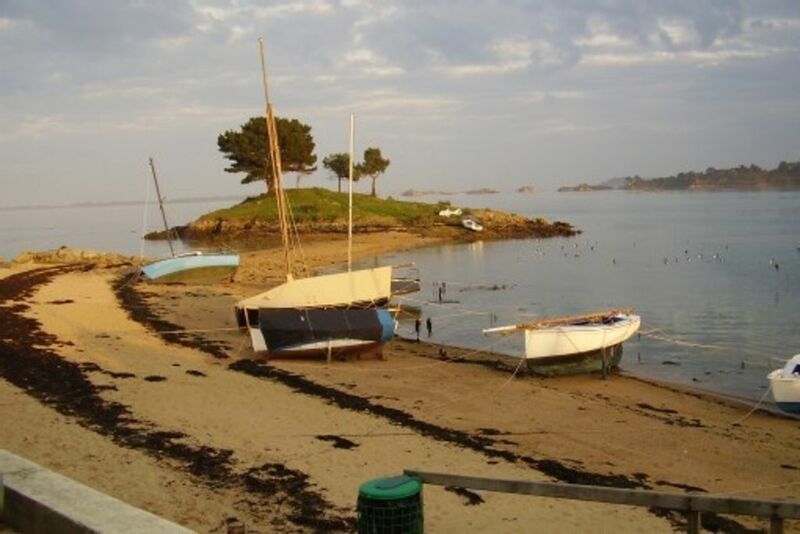 It is 40 km from the airport of Lannion and Perros-Guirec and 14 km from Tréguier, historic town with stunning cathedral. You are provided with 2 bikes for free to go biking in our wild peninsula.